Add Jewelry Appraisal For $65 *Jewelry Appraisal cost is non refundable. All our diamonds are free of any natural or human exploitation- that’s beyond 100% conflict free. Engineered with precision in a lab-controlled environment, all our diamonds are an eco-friendly alternative over mined diamonds. Lab diamonds possess the same physical, chemical, and optical properties as natural diamonds, making them absolutely real. We provide certification of renowned laboratories on all lab grown diamonds above 0.5 carats. Lab diamonds offer exceptional value, and are reasonably more affordable than a natural mined diamond of a similar quality and size. We offer Lifetime warranty on all our stones. If there's ever a problem with your stone, we'll fix it or replace it for free. Even if you lose your stone, we will replace it at cost and with no charges for resetting. An elegant and artistically designed piece of jewelry, like this hexagon ring, is a wonderful way to display your affinity for something that's sophisticated and eco-friendly. The radiant 14k white gold metal makes an alluring background for the pave set lab grown diamonds that cluster together and adorn the hexagon frame. Their purity and luminescent charm is elevated by milgrain detailing seen on the silhouette. 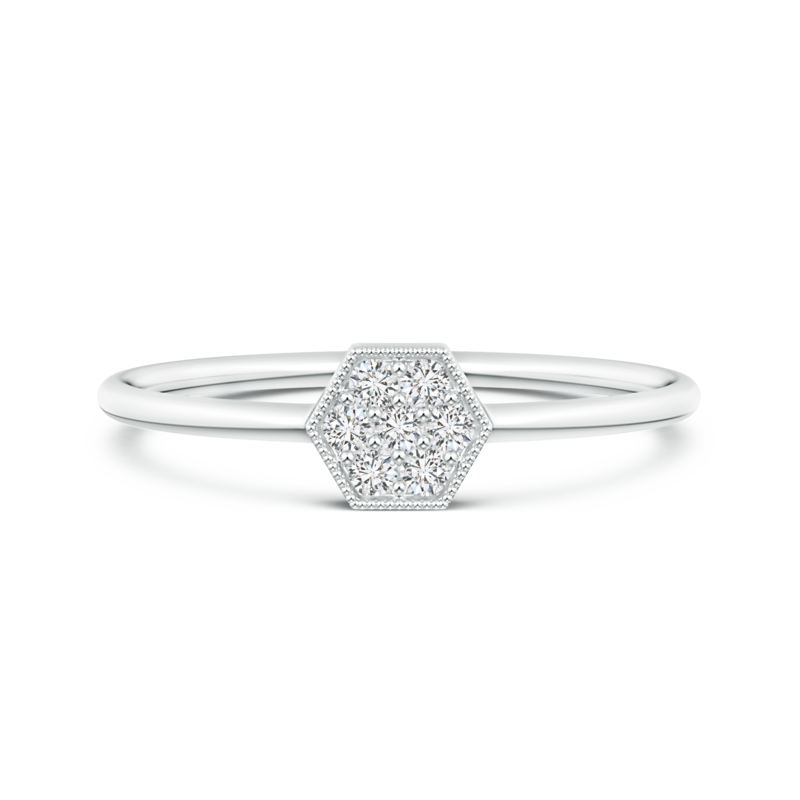 The versatility and charisma of this diamond ring makes it a great addition to your jewelry box. For centuries, rings have been adorned by both men and women to signify class and affluence, and wearing multiple rings was the perfect way to display superiority. This ancient practice has now evolved into the trend of stackable rings. Adorning your hands with more than one ring on the same finger is an alluring look that can be achieved with sleek and charming pieces in various metals. Our collection of stackable rings, featuring contemporary and fashionable designs, allows you to choose and create a combination that best reflects your personal sense of style. © 2019 Pureignis.com. All Rights Reserved.